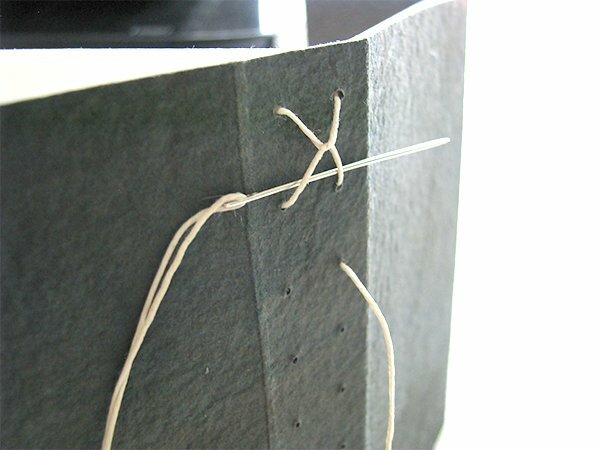 Today I’m sharing a tutorial for a book I created a few weeks ago with an Alpha Stitched binding. 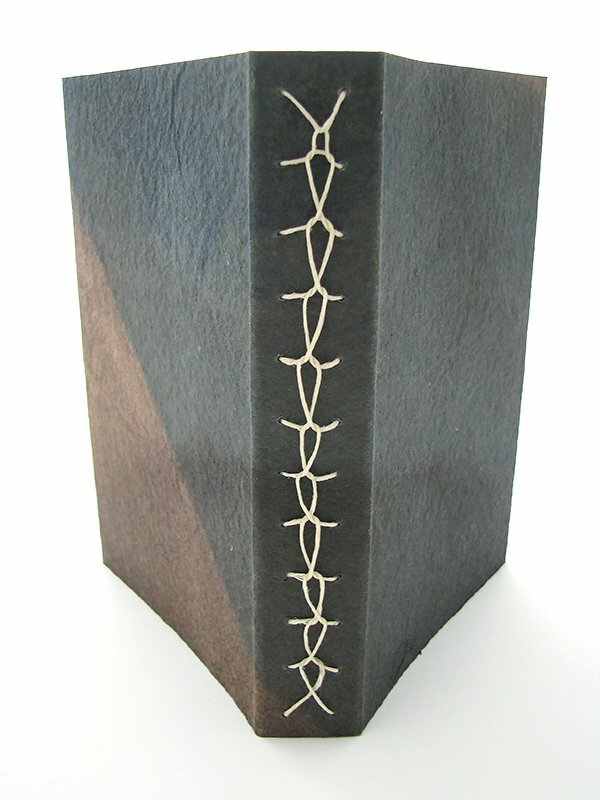 The binding is from Volume II of Keith Smith’s Non-Adhesive Binding, 1- 2- & 3-Section Sewings. My original book had a hard cover but today’s example has a soft cover. 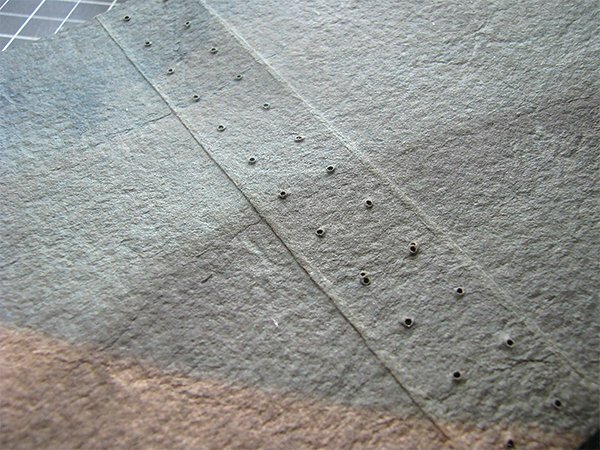 Trust me, it’s much easier to pierce all those holes in paper rather than board. 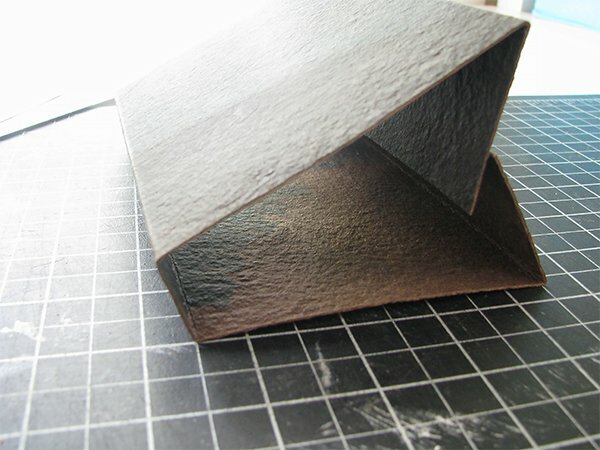 Place cover paper horizontally on work surface. Use a bone folder and ruler to score vertical lines at 2″, 6″, 7″ and 11″. 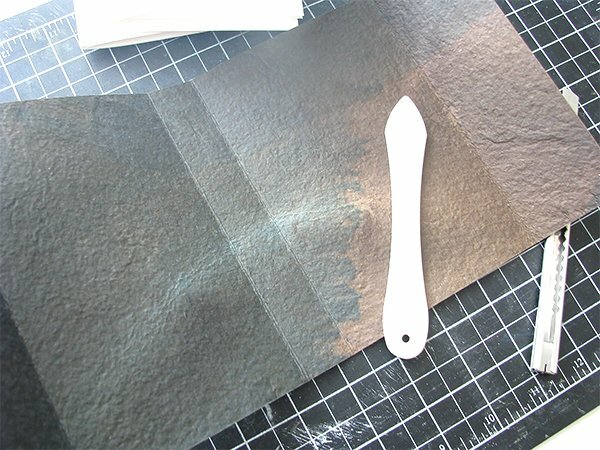 Fold score lines and smooth with bone folder. This creates the spine and turn-ins. Note: if you don’t want the book to have turn-ins, reduce the size of the paper to measure 6″ x 9″ and only score at 4″ and 5″ to create the spine. The number of pages in your 2 signatures will depend on the paper you choose. I used a thick watercolor paper and only had 4 sheets in each. If you choose a thinner sketch book or copier paper, you can use a lot more. 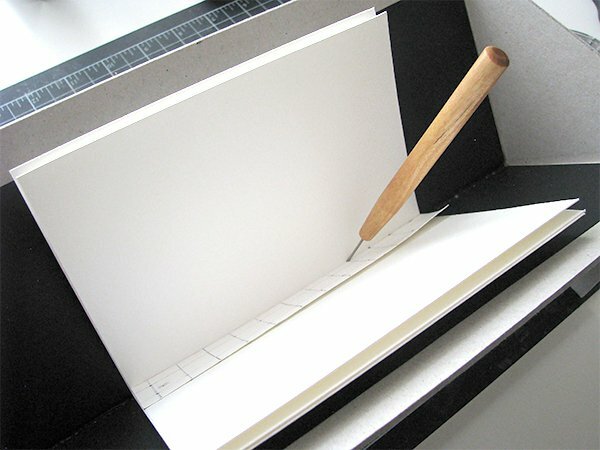 Fold the pages in half to form 2 signatures and smooth with a bone folder. 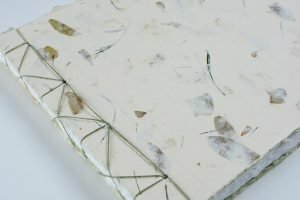 Press under heavy books for several hours and trim the edges if necessary. Make a light pencil mark to indicate the head (top) of each one. 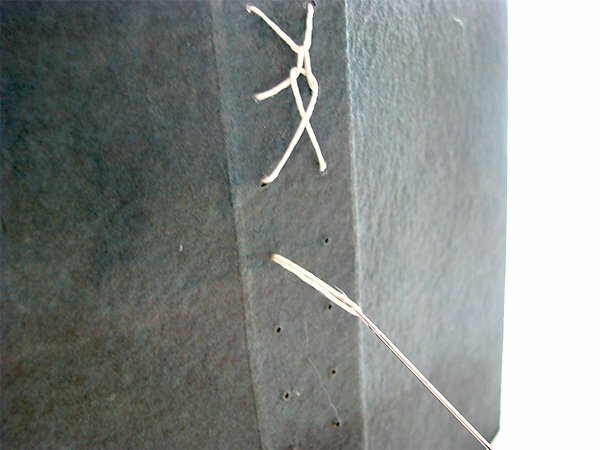 Lightly mark the head of the cover with a pencil. Print and cut out the punching template. 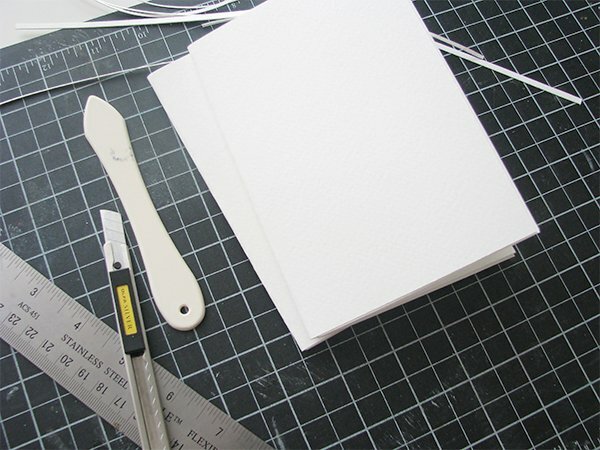 Place the cover on a cutting mat and put the template on the spine. Be sure to align the head of the cover and template. 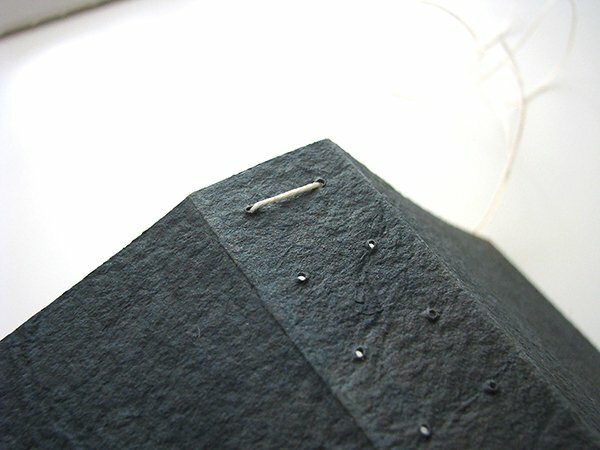 Using an awl, gently pierce the sewing holes. Remove the template and widen holes with the awl. You will have 24 holes in total. Note: you can hold the template in place on the spine with removable adhesive. Place your first signature in the punching cradle and place the template in the center. Make sure the head of the signature and template face the same direction. Using the vertical lines on the template as your guide, punch a single row of holes in the center of the signature using an awl. Make sure you go all the way through. Repeat for second signature. Each signature will have 12 holes. 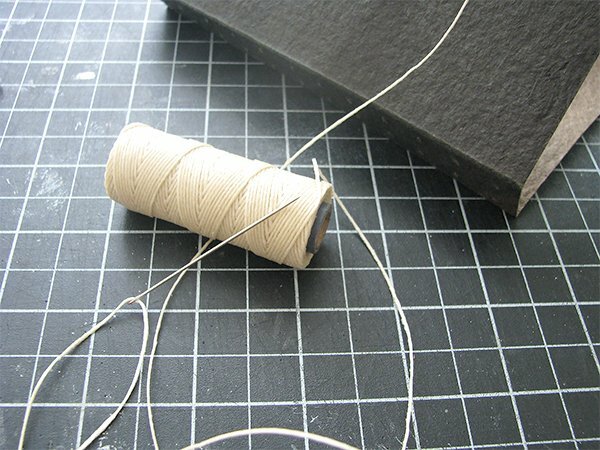 Thread the needle with waxed thread but don’t tie a knot in the end. You’ll need about 30″ or 5 times the length of the book. Place your template next to you so you can refer to the numbers when sewing. 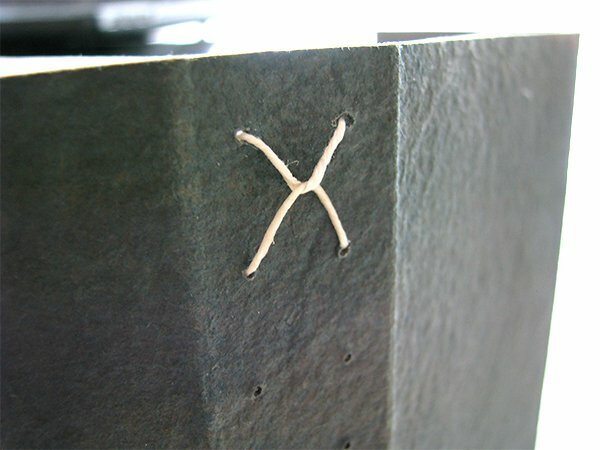 Enter sewing hole 2 from inside the signature to outside cover and leave a 2″ tail. Enter sewing hole 1 from outside cover to inside signature. Enter sewing hole 3 from inside signature to outside cover. 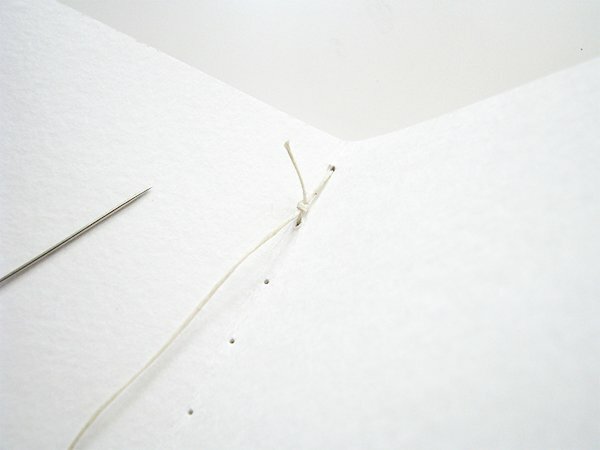 Thread needle through previous stitch by entering it from above. Enter sewing hole 4 from front cover to inside signature. This is your anchor stitch and is different from subsequent stitches. 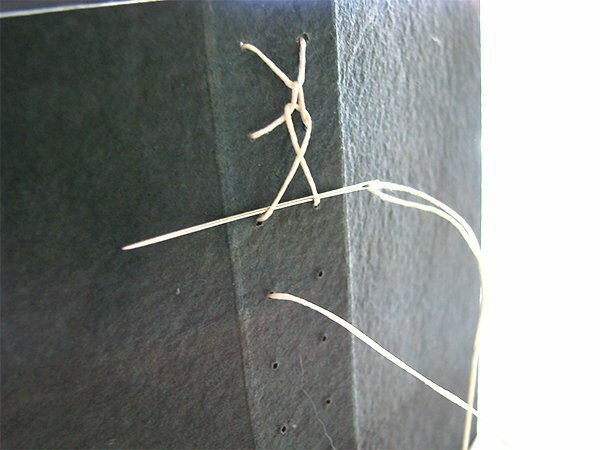 Tie off loose thread inside signature and snip end to 1/4″. Exit sewing hole 6 from inside signature to outside cover. Bring needle through stitch above from left to right. Enter sewing hole 5 from outside cover to inside signature. 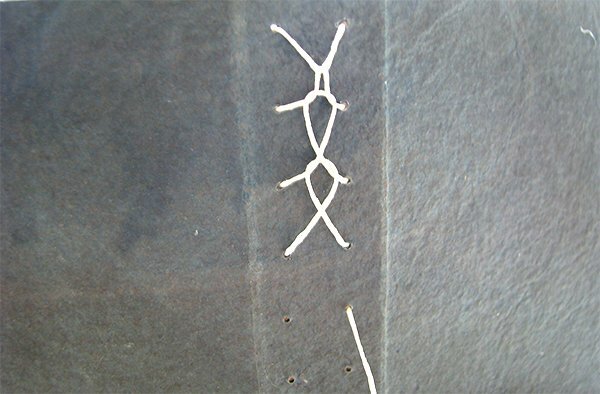 Make sure you keep your sewing tension even to create uniform sized and shape stitches. Exit sewing hole 7 from inside signature to outside cover. 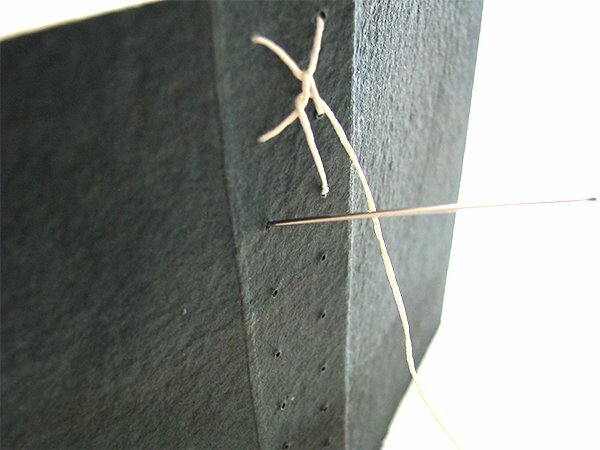 Bring thread through stitch above from right to left and enter sewing hole 8 from front cover to inside signature. Exit sewing hole 10 and repeat the stitching pattern until you reach the final sewing hole. Complete final stitch and enter sewing hole 24 and tie off inside. Clip thread to 1/4″. If desired, secure the turn-ins with double stick tape. 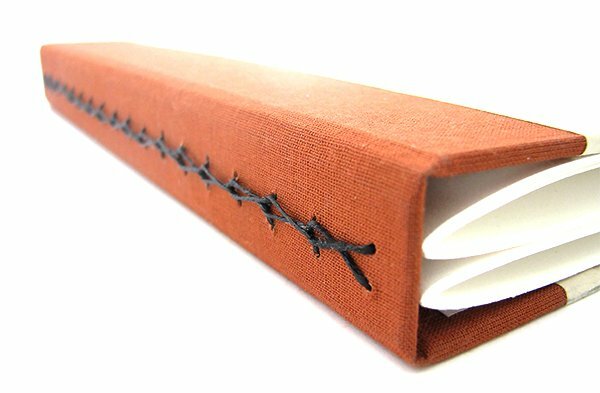 Here’s another book with an Alpha Stitched spine. This stitch is narrower because the distance between the holes is 1/4″ whereas the one we made today has its holes spaced 1/2″ apart. If you make this book please let me know in the comments. I’d love to see photos of your work and share them on the blog. If you don’t want to miss any more tutorials, please subscribe to my newsletter. I just read the comments from last spring–hope it is still a viable conversation. 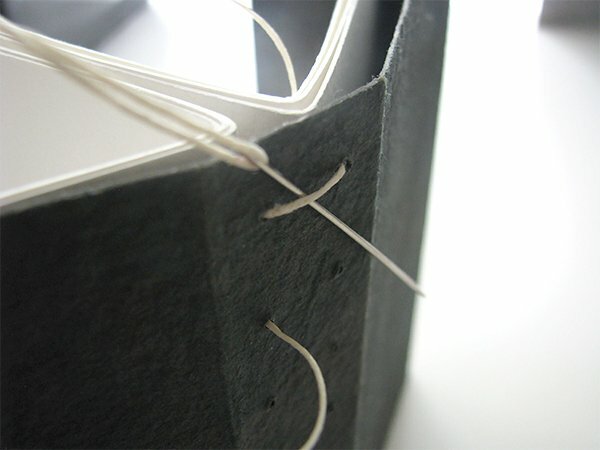 The pro of doing visible stitched bindings, for me, is the added visual appeal of the stitching. 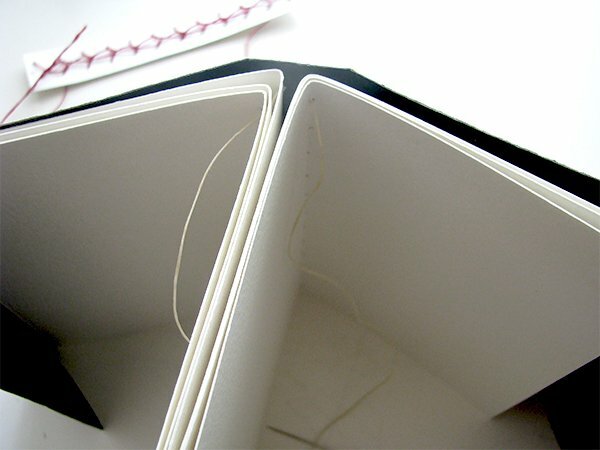 This binding is a form, I believe, of the pamphlet stitch and the pages do lie flat using such a binding. 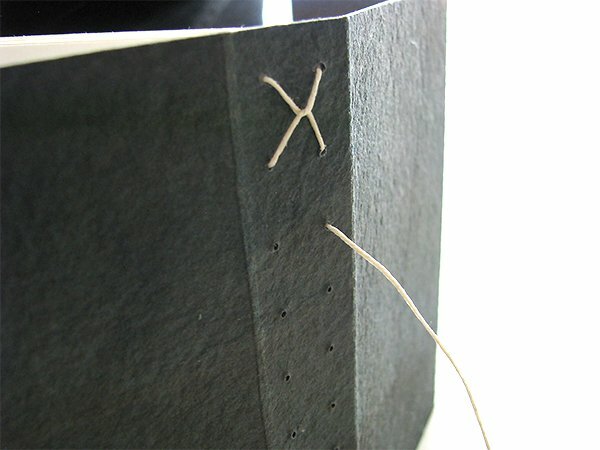 Also, the coptic stitch is a very secure binding but also a bit time consuming whereas the variations of the pamphlet stitch move a bit more quickly. 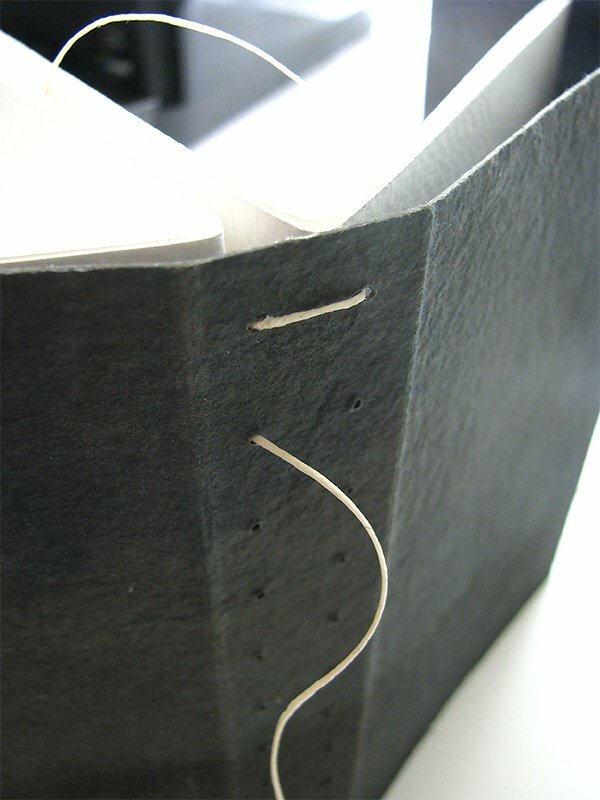 Just finished this binding and it looks great! If you want more signatures you’ll have to have an even number and sew them in groups of two, at least that’s what I’m thinking. Thanks for sharing it. Is that true? I was wondering the same thing and no comments confirmed this. Your directions are very clear and I’m going to attempt this stitch with my next project. I’m brand new to book making and learning everything as I go along! Thanks for your great tutorial. Dying to try this one!